One of the best and worst things about the Eee PC is its “easy mode” user interface. 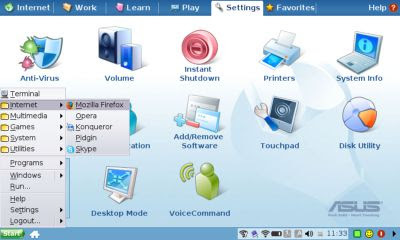 In easy mode, you have no start menu, and little ability to access some of the Eee PC’s more advanced features (unless you know your way around a terminal, which you can pull up by hitting Ctrl+Alt+T). If you like to customize your desktop, easy mode can be pretty frustrating. On the other hand, everything is well designed to fit on the Eee PC’s 800 x 480 pixel monitor. (Well, almost everything. Every now and again a menu will pop up that you just can’t edit properly because it extends below the screen. But we’ll get to that in another post). And restricting access to some of the more advanced features is probably a good thing for many users who aren’t familiar with Linux. It turns out there is a pretty simple way to enable a full KDE desktop, but if you want the best of both worlds, you can also add customizable start menu to your easy mode interface. Somewhat ironically, this might be harder than enabling the full desktop. Read the rest of this post at Eee Site.